Near the beginning of the film, Belle's father Maurice (Kevin Kline) sings How Does a Moment Last Forever while crafting a music box and reminiscing about his deceased wife. Later, Belle (Emma Watson) sings the melody with different lyrics when she discovers the truth about her mother's death when she was a baby. Celine Dion's rendition of How Does a Moment Last Forever plays during the film's closing credits. 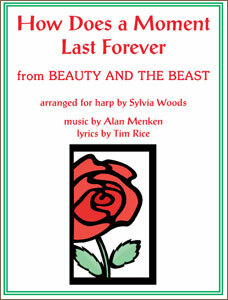 Sylvia's harp arrangement is for advanced-beginner to intermediate harpists. It is in the key of G (1 sharp), and requires C# and D# lever or pedal changes. Lyrics, fingerings, and chord symbols included. 6 pages of music. The harp range needed for this piece is 4 octaves, 29 strings from G to G. If you play the first and last lines an octave lower than written, in relation to the rest of the piece, it will fit on a harp with at least 23 strings from G up to A.
Click on the next to a track to listen to a preview.